Today's Letters: Dear Mr. Loerke, last night I dreamt about saying good-bye to a dear friend while eating cupcakes. You dreamt about being chased by a polar bear that had escaped from the zoo. Reason #256 why boy roommates are AWESOME. Dear Watch Tan, thanks for reminding me of all things summer. I've missed you. 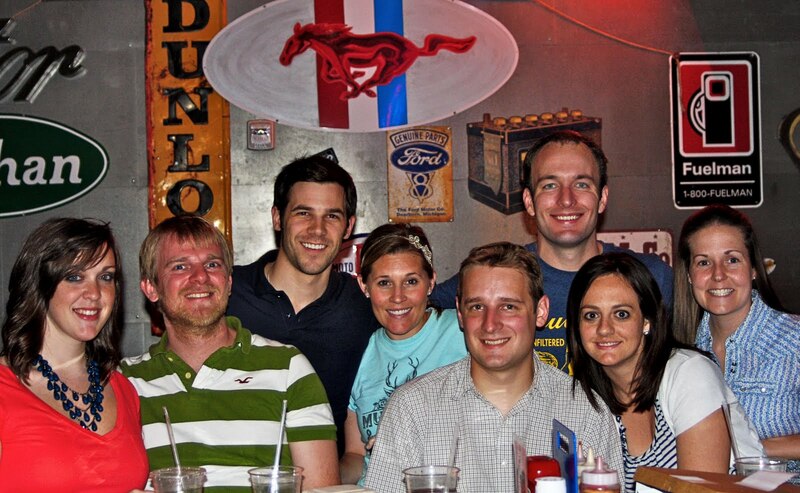 Dear Twisted Root, you were the perfect hangout for our Foundation Group hot date on Friday. Your burgers, sweet potato fries, homemade root beer, wasabi pickles, and washer pits had us throwing fist pumps and leg shimmies all night long. Dear Husband, today is the first day of your last rotation. BOO TO THE FREAKIN YEAH. Happy Freakin Monday, Homies! What's your favorite cupcakery? Society Bakery will always be #1 in our bellies. Be sure and check back later for our weekly MR340 race update from the Em's! And in case you missed Mr. Loerke's recent announcement, he's going to be taking the next 6 weeks off from writing letters so he can focus on finishing PA school. That said, we've got an unbelievable lineup of guest bloggers headed your way! This Friday we'll be featuring letters from Naomi Davis of Rockstar Diaries. Get ready for AWESOMENESS ... She's pretty much my blogging hero! Oh I absolutely love Naomi! I can't wait!! Ooh I love Naomi and her blog! Exciting times :) I'll definitely be checking out her letter. i LOVE a summer watch tan! can't wait for the sun to get out and bring mine back! I love Naomi!! I ran into her in DC when I visited the Easter Market Lunch. She and her husband are so nice! And I love your blog and would love running into you any day! I do love me some cupcakes! I haven't found a place I really love, but a baker friend of mine gave me her buttercream icing recipe which has certainly taken mine to a new level :) Fun post!